Mr Davis has studied with internationally recognised leaders in ear reconstruction including Dr Francois Firmin (France), Dr David Gault (UK), Dr S O Wickstrom (Sweden), Dr Burt Brent (USA), Dr David Fisher and Dr John Vandervord (Australia). His current technique is a mosaic of each of these experts techniques and he has performed ear reconstructions in Sweden, Sydney, Sri Lanka, Vietnam and Malaysia as well as New Zealand. What is the purpose of an ear reconstruction? 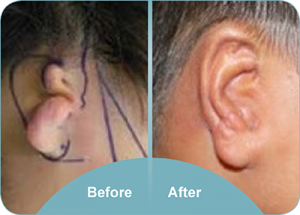 An ear reconstruction aims to rebuild an external ear that is closer to normal in appearance. At a quick glance to a casual observer it should look like an ear and not catch the eye in the way an untreated ear might. Microtia is often associated with abnormalities of the middle ear and hearing impairment. Outer ear reconstruction does not improve hearing. 30-40% of patients with facial deformity experience psychological distress at some time and this is usually relieved with reconstructive surgery. Ear reconstruction is also useful for those who wear glasses. What are the usual causes of an ear anomaly? Microtia occurs in about one in every 3000 births and it may be isolated or part of a syndrome such as hemifacial microsomia, Goldenhar syndrome or Treacher Collins syndrome. There are about 20 new cases of microtia in New Zealand each year. Ear reconstructions are also done for accidents like dog bites and after cancer treatment. A prosthetic ear may be created using the normal ear as a template. Two operations will be required. At the first stage any ear remnants are removed and titanium implants are embedded into the bone on the side of the head. At the second operation, usually 4 months later, a metal frame is attached to these implants. The prosthetic ear is clipped onto this metal frame. A prosthetic ear will require regular maintenance and needs replacement every two years. The area around the implants must be cleaned daily and the prosthetic ear is generally removed at night. This can be a good option for adults with extensive local scarring such as burns where the local tissue may not be ideal for a surgical reconstruction. What about surgery to improve hearing? Reconstruction of the hearing mechanism and ear canal is possible in some children who have bilateral microtia. The new Bone Anchored Hearing aid system may be available for those children who are not suitable for reconstruction, or if their parents prefer this. On some occasions children with only one ear affected may be suitable for a bone anchored hearing aid. Assessment of hearing in the classroom by education department staff is recommended before referral for this. Children who have a tiny ear canal (“pin hole”) should have a CT scan of the ears at age 3 to exclude the possibility of cholesteatoma, a destructive build up of skin cells internally. What is the timing of surgery? By age four, the ear is nearly 85% of adult size. However the chest is not sufficiently grown and most ear reconstructions are usually postponed until about age 10 or older. The advantage of waiting is to ensure sufficient cartilage for the framework and less growth disturbance of the chest wall. Earlier surgery is considered when the child is suffering extreme psychological distress. What is involved in an ear reconstruction? The new ear is made from the patient’s own tissues and requires at least two operations. In the first operation cartilage is taken from the rib cage and carved to create a framework that resembles a normal ear. The other ear is used as a template if it is normal. This cartilage framework is inserted beneath a pocket of skin. This operation takes 3-4 hours and the child stays in hospital for about 2-3 days. At this stage, the shape of the new ear can be seen but it will lie flat against the side of the head. At the second operation the ear framework is elevated and the groove behind the ear created. This is normally done at least four months after the first operation to ensure a good blood supply to the cartilage framework. A flap of tissue from the scalp covers the back of the cartilage which is in turn covered by a skin graft. This operation takes about three hours and the child stays in hospital for two days. The new reconstructed ear is quite stiff and does not bend like a normal ear. However it is warm and will eventually get some feeling. Possible complications may include the need for revisions. It is important to realise that the new ear will not be exactly like a normal ear.